Fax/Email us your floor plan. Fax/Email us a rough sketch. 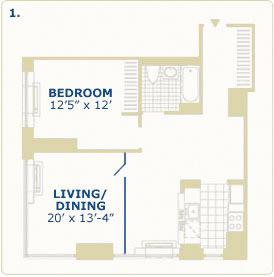 Fill in our Floor Plan Template Form. 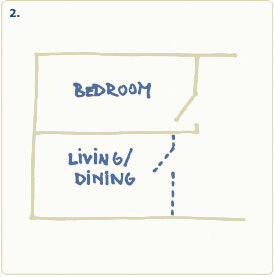 Door Guidelines: Doors should swing into the bedroom in order to avoid accidents (if you open the door out to the common area you might hit someone). We recommend to do so even though you are trying to save precious space. 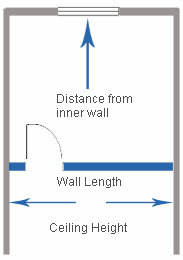 Doors should swing towards the wall that is close to them, in order to make the best use of space. Choose option A or B regarding door placement & swing. Fill in text boxes (connected to arrows) with the measurements (feet & inches). 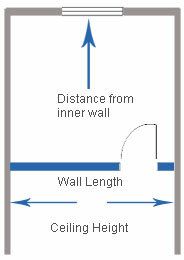 Includes wall length, ceiling height and where you wish the wall to be installed in relation to external wall.